Caroline H. Yang received her B.A. in English from the University of California, Berkeley, M.A. in English from Boston College, and Ph.D. in English from the University of Washington, Seattle. She is the author of The Peculiar Afterlife of Slavery: The Minstrel Form and the Chinese Worker in American Literature (Stanford UP, forthcoming), which focuses on blackface minstrelsy as a US cultural institution that played a crucial role in literary representations of the Chinese during and after Reconstruction. 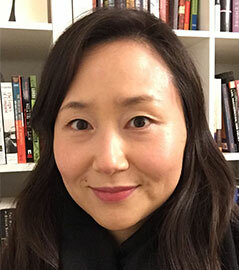 Her next project centers on figures and spaces of work and war in late twentieth century and contemporary Asian American and African American literatures in the context of global racial capitalism and US militarism. The Peculiar Afterlife of Slavery: The Minstrel Form and the Chinese Worker in American Literature (Stanford UP, forthcoming). "Bret Harte's 'Heathen Chinee' in US Literature after Slavery." Asian American Literature in Transition Volume I (1850-1930) (Cambridge University Press, forthcoming). "Slavery in Sui Sin Far's Early Fictions." Journal of Asian American Studies, forthcoming in June 2019. "Indispensable Labor: The Chinese Worker as a Category of Analysis in China Men." Modern Fiction Studies (MFS) 56.1 (2010):63-89. Interracial Encounters: Reciprocal Representations in African and Asian American Literatures, 1896 -1937 by Julia H. Lee (New York: New York University Press, 2011), Journal of Asian American Studies16.3 (2013): 340-342. Subverting Exclusion: Transpacific Encounters with Race, Caste, and Borders, 1885-1928 by Andrea Geiger (New Haven and London: Yale University Press, 2011), Montana The Magazine of Western History 62.3 (2012): 73-74. Model-Minority Imperialism by Victor Bascara (Minneapolis: University of Minnesota Press, 2006), Journal of Asian American Studies 11.2 (2008): 235-239.